"This [play] sure had its show-stealers. literally left me in tears of laughter whenever he was onstage." a dark comedy about the Black Plague! Michael is currently featured in a reading of Nick Linnehan's play The Stars of Lubovna. "Schiz," Bi-Polar, and Other Neurological States of Being . . .
collaborating on the duet "Perfect Guy"! The Cherry Orchard in February 2014. A re-envisioned, re-envigorated Cherry Orchard as a comedy (and as Chekhov wanted it!) with the signature Nicu's Spoon mix of non-traditional, gender-bending, abled/disabled casting. This is a limited run of 7 performances as a culmination of a documentary being made about this company and its process and artists. Tickets are on sale now at OvationTix or at Nicu's Spoon Theater! Dorian Gray is coming back! "an international festival for solo performances." 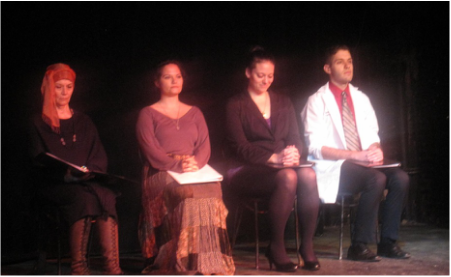 will be performed Off-Broadway at Theatre ROW. Tickets are available through Telecharge.